"Pernambuco is the equal of BRW tonally, although it is different. It tends to be more balanced: less "glassy" in the trebles, and has a little less tendency to boom in the bass. Overall just a beautiful, balanced, articulate tone, vibrant in all registers. And it is visually very beautiful. It only grows in what remains of the Brazilian Atlantic forest. 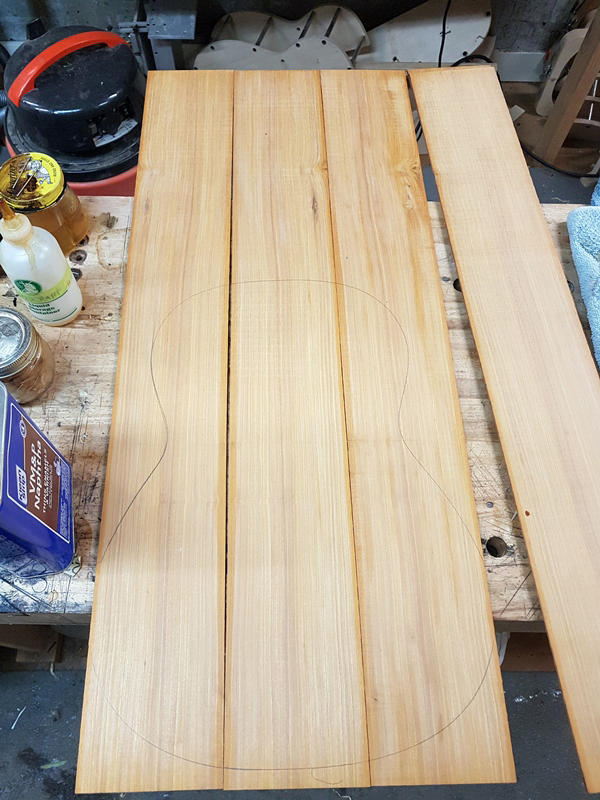 It's rarely available in guitar sets, and not at all from the usual commercial guitar wood suppliers. 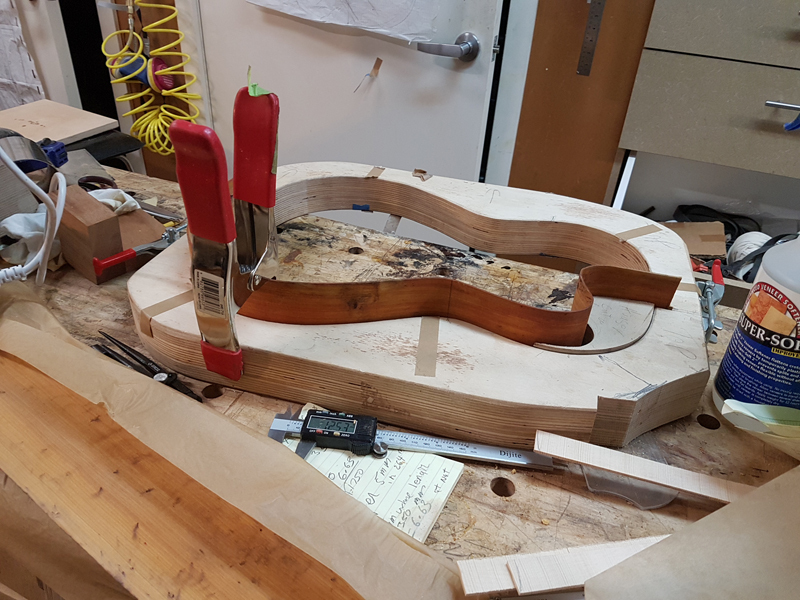 Factories have none of it, and only a few hand builders do, so most people may not get to hear a guitar made from it." The wood should be interesting what I have has a good taptone although I needed to make a three piece back. 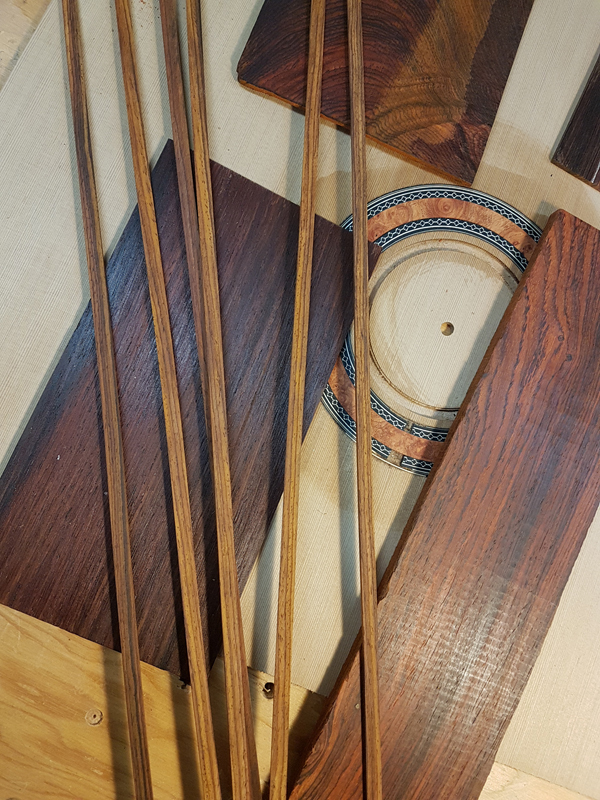 I find it closer to african blackwood than I do BRW. Here are some pictures plus my measurements. As you can see it is very dense but also stiff so I will be able to have a back about 2 mm. It will be interesting to hear how it sounds as a live back. 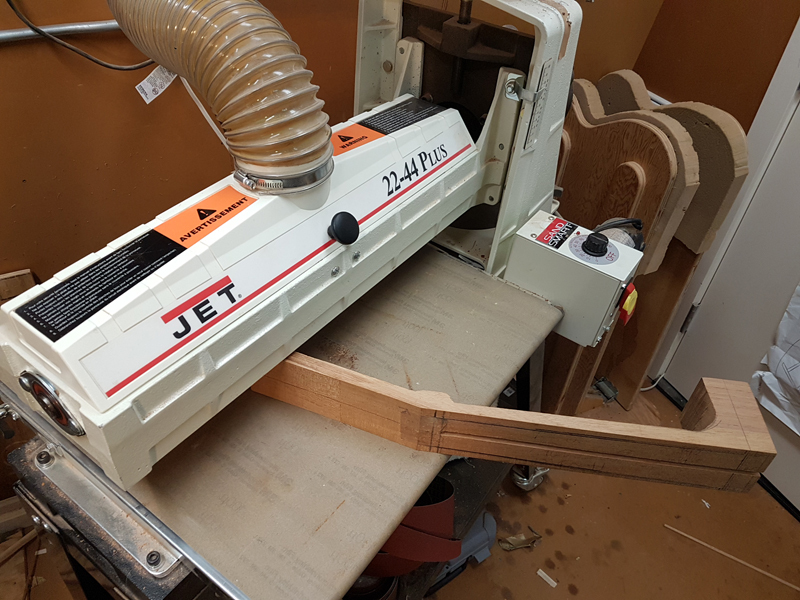 The customer had it resawn and we were able to get 2 sides and three pieces for the back. 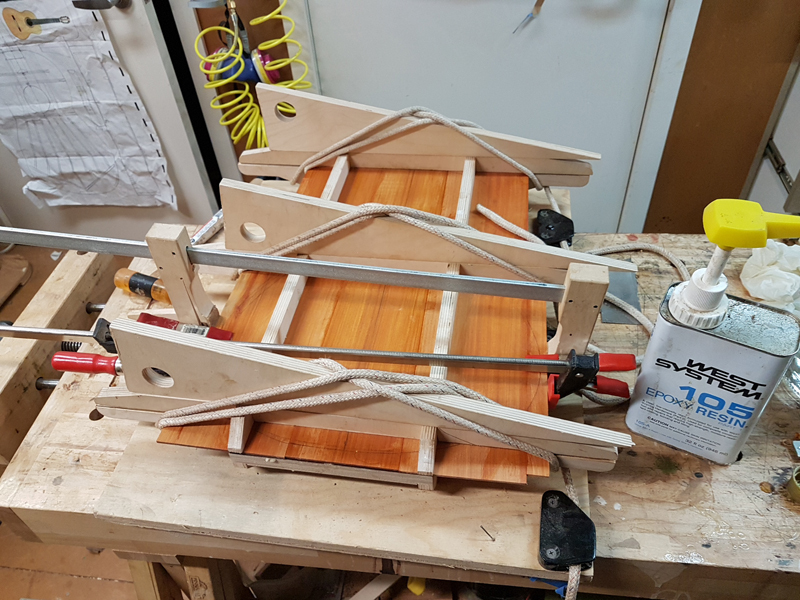 I also had to install 2 wings on the upper bout that will mostly be removed with the binding. With 4 joints I went with some west system epoxy for the joint. 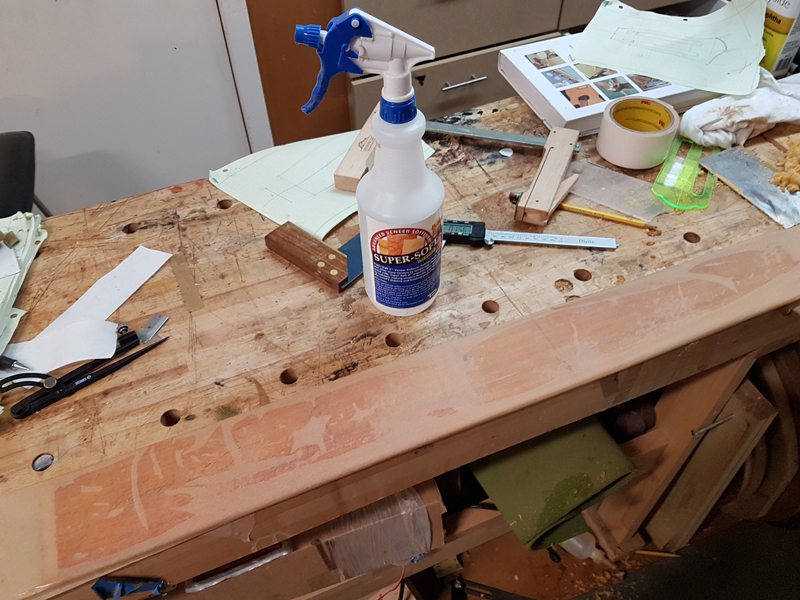 I took care to plane the center board to a symmetrical trapezoid. Over all there my be some that will never know it is a multi piece back. 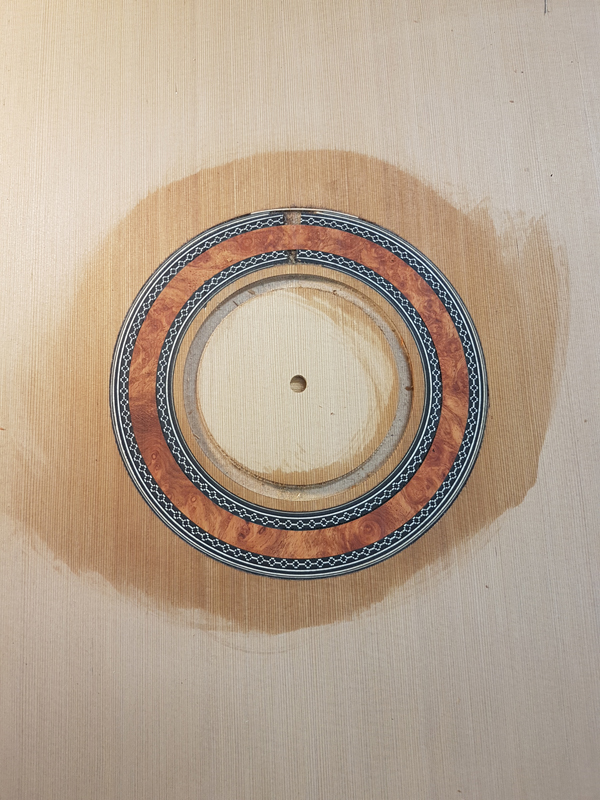 I joined the top and made a classical like rosette by installing a premade rosette with a couple of extra purfling lines, routing out the center of the rosette and replacing it with some book matched amboyna burl. 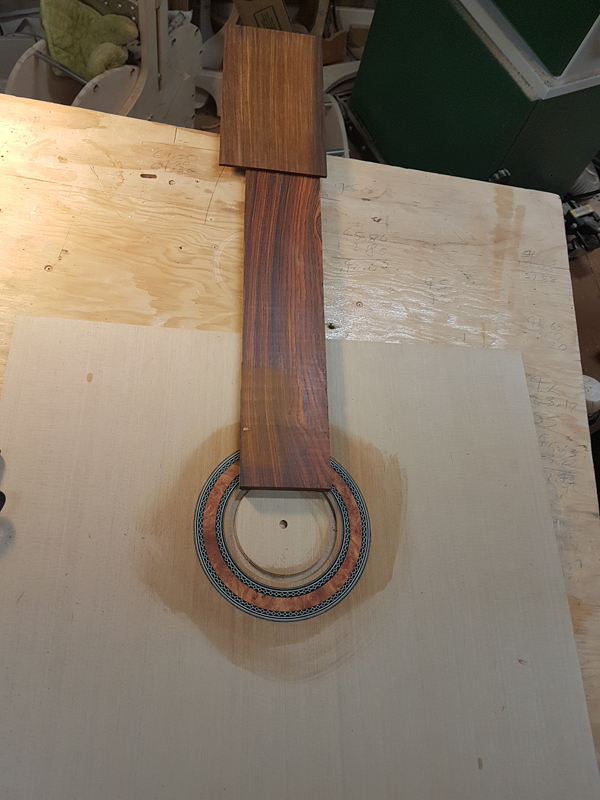 With the rosette installed I selected a BRW head plate veneer to go with the customer supplied cocobolo fretboard and installed rosette. 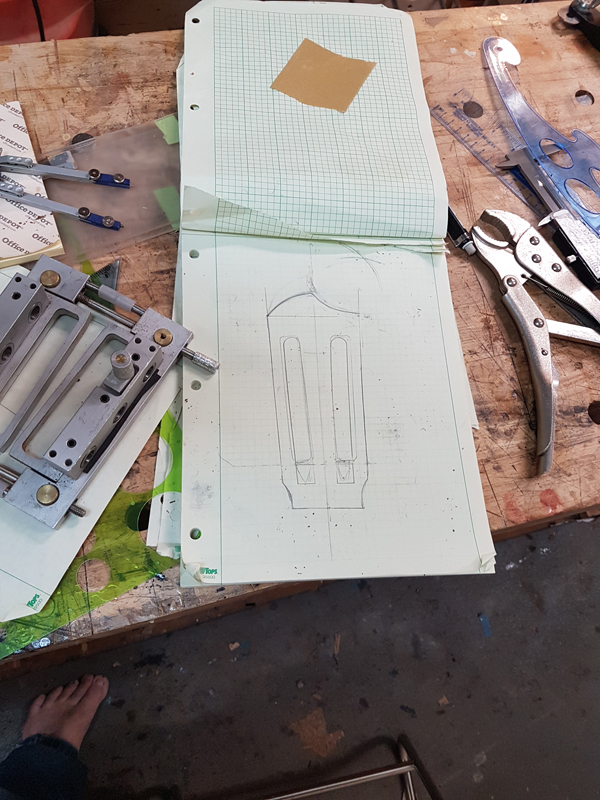 The next steps were to get the blocks ready for the body. 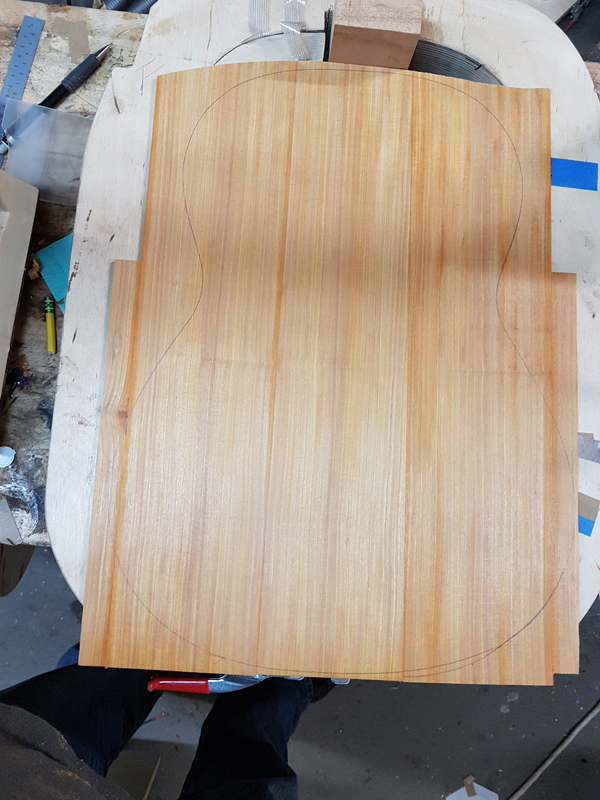 This guitar will be a cutaway with a bolt on bolt off neck using Trevor Gore's design. 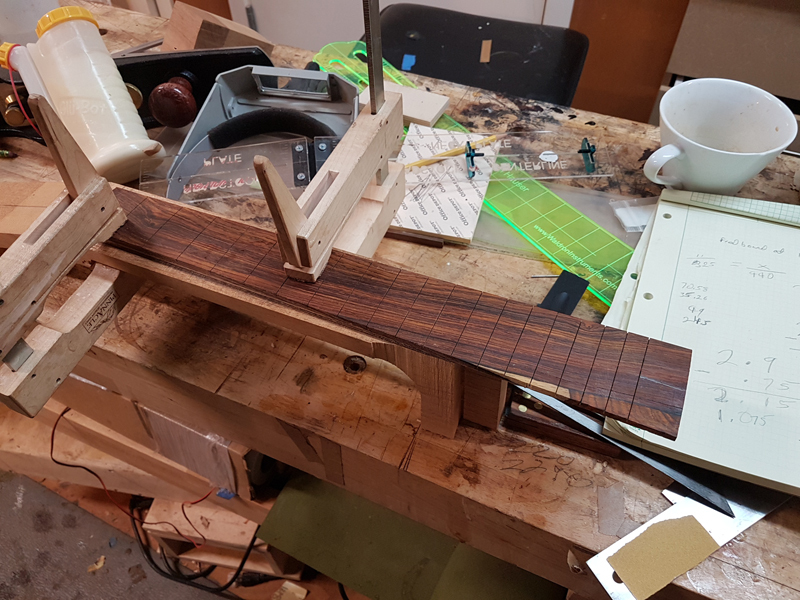 So first off you will see that the block has an extension for the fretboard extension that will allow the fretboard extension to be bolted down. 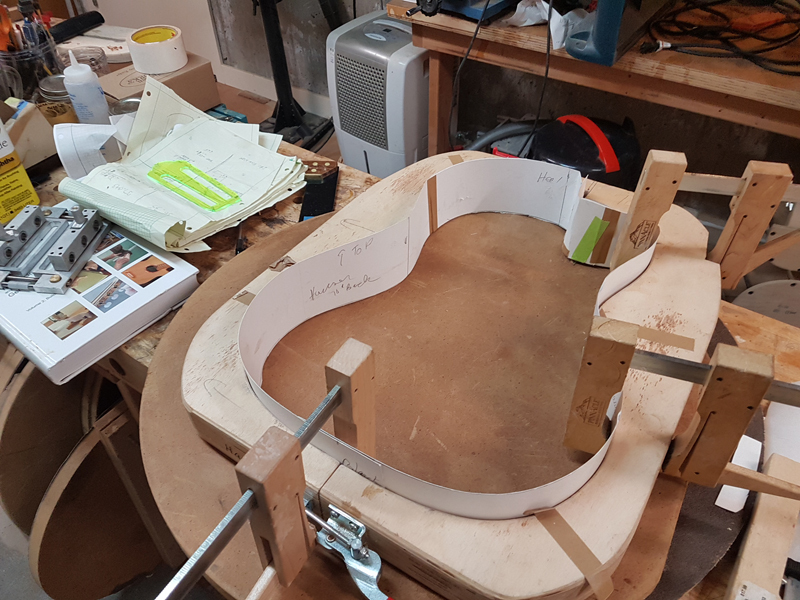 I use plywood for my tail blocks and use a Luthier's Friend drum sander to take the edges down to match my lining thickness. 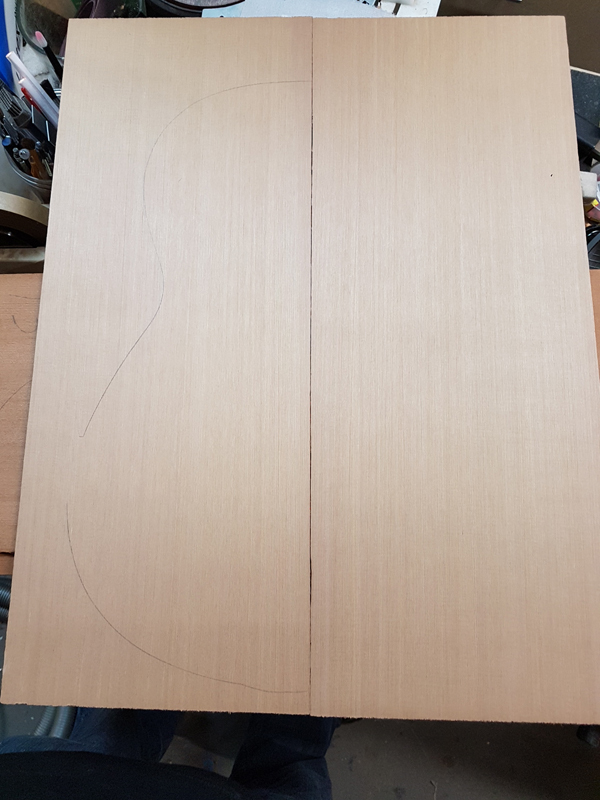 While making my 14 fret body join nylon string guitar I accidentally made a 12 fret join neck blank. So I used it for this guitar. 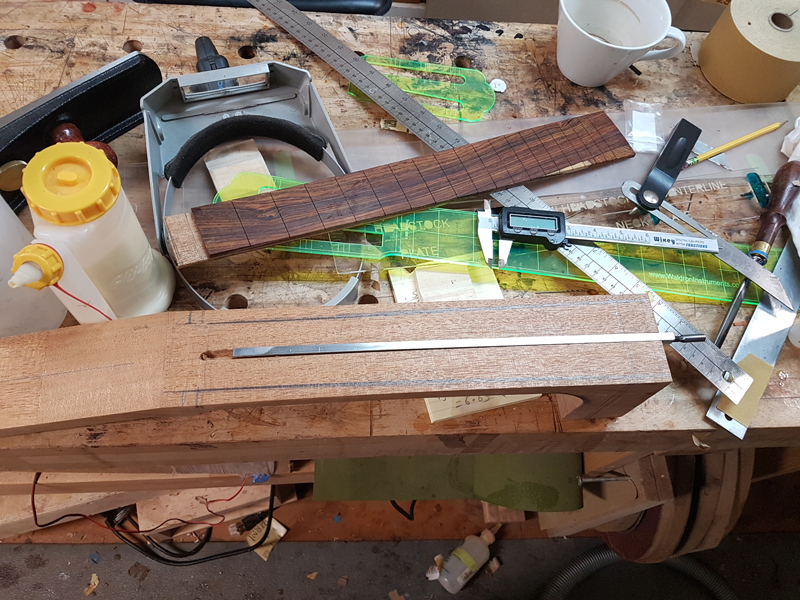 The neck is pretty involved as the design tilts the neck like a steel string to match a radiused top and and a separate 4 mm wedge under the fret board to tilt the plane on the neck back more appropriate for a classical guitar. 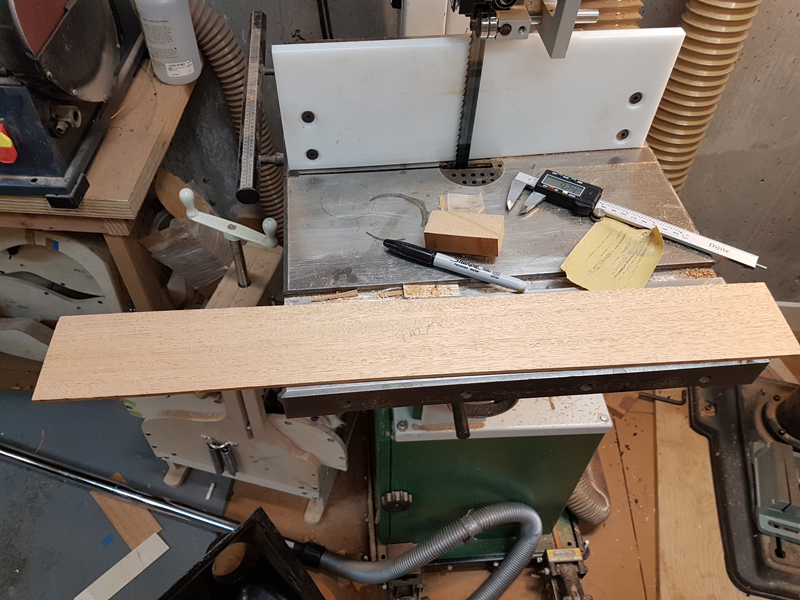 The wedge is 4 mm thick at the nut down to zero somewhere after the 12 fret. 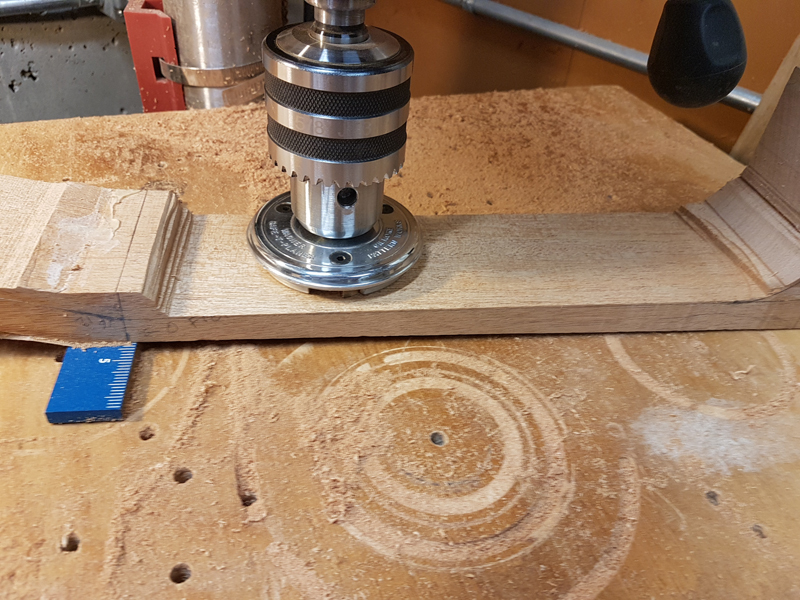 So the opposite adjustment needs to be made when thicknessing the neck to deal with the extra thickness. 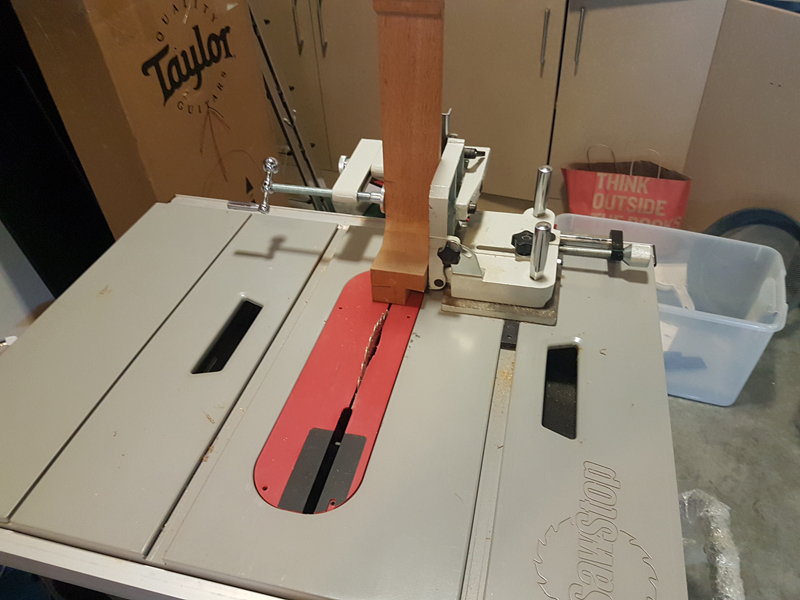 I had a spacer that was basically the right size to tilt the neck so that I could cut the neck taper in my blank with a safety planner. 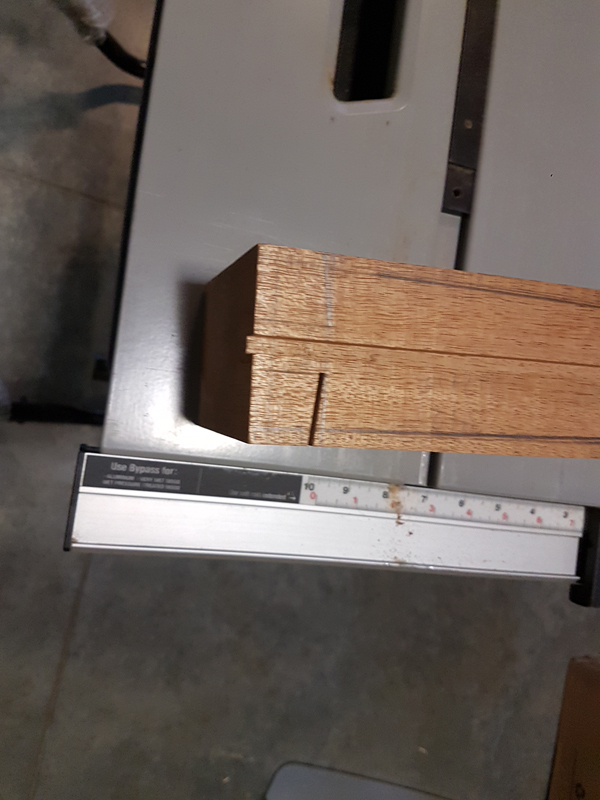 I found some matching mahogany so I resawed a 5 mm slice out that I will clean up in the drum sander and use for my wedge. 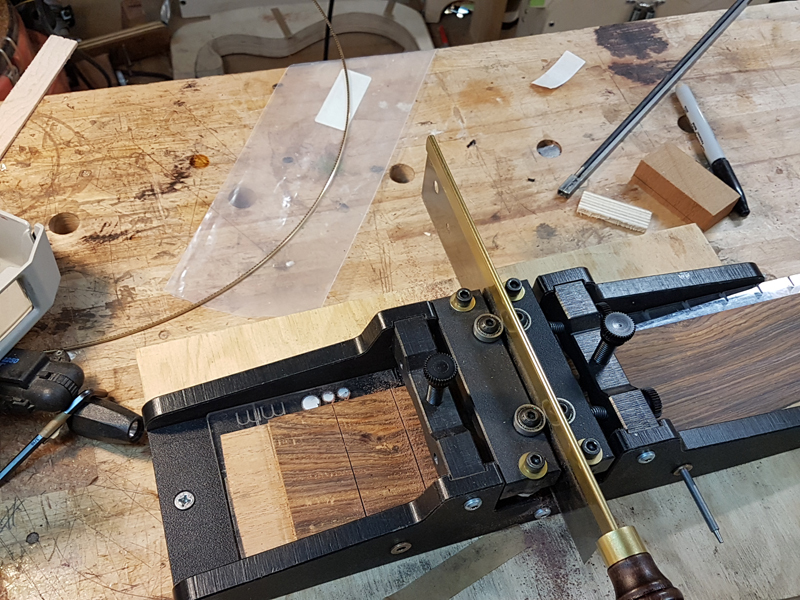 I put a 4 mm shim on the neck near the nut location and cut my truss rod slot. 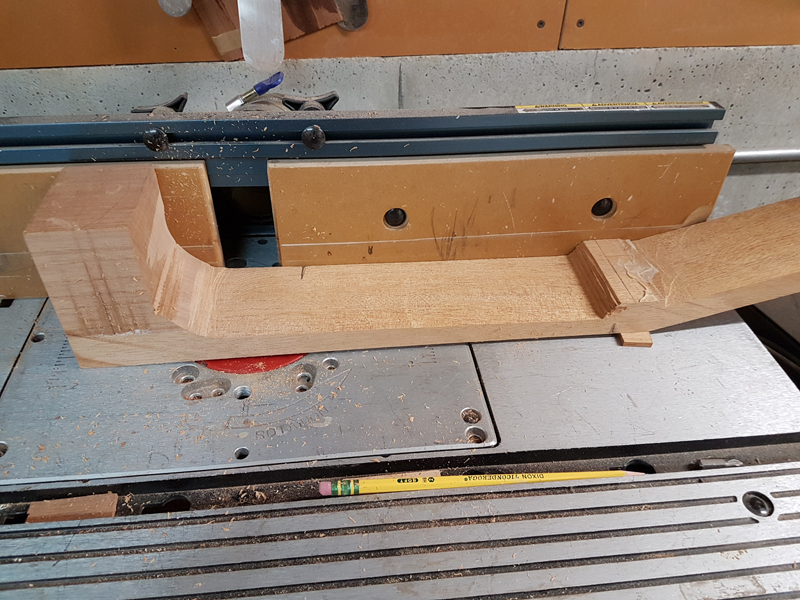 It is angled as the wedge will be slotted as well. 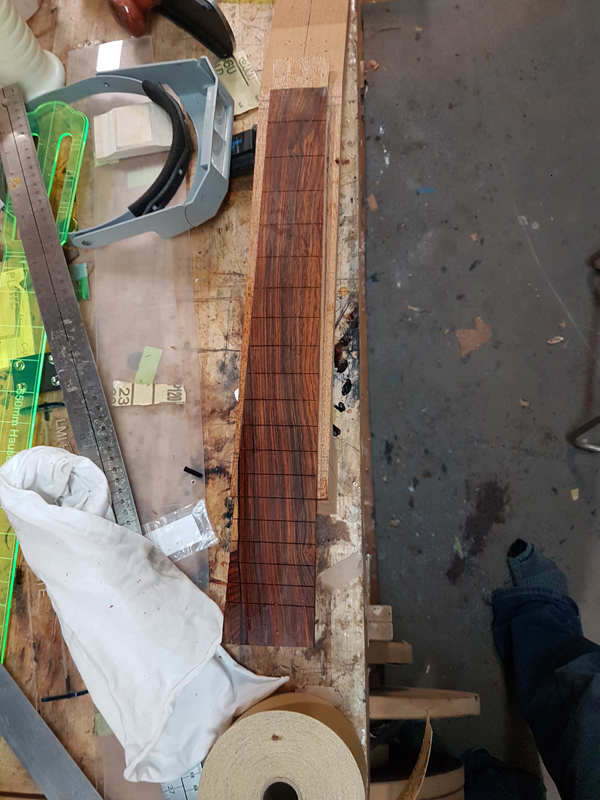 I glued the 4 mm slice of mahogany to the fretboard and put a truss rod slot in. 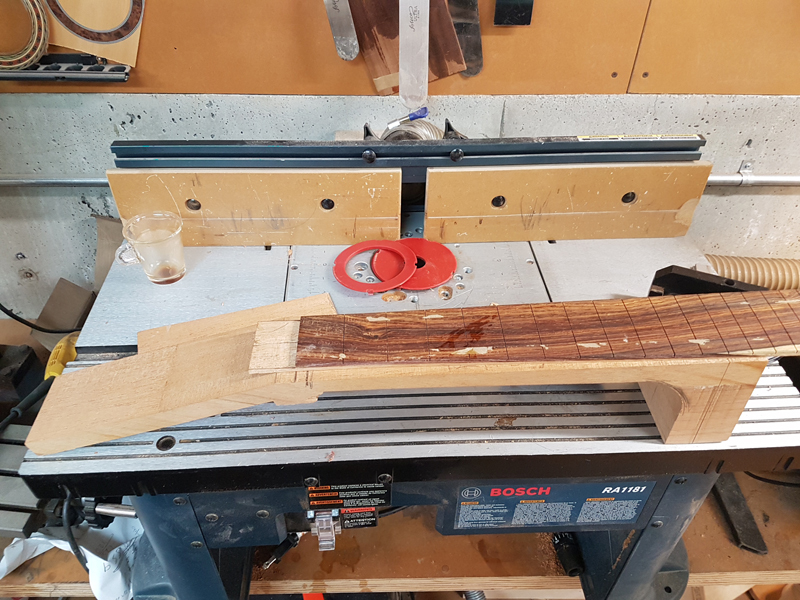 I made it as deep as the truss rod stuck out of the neck at its tallest near the nut. 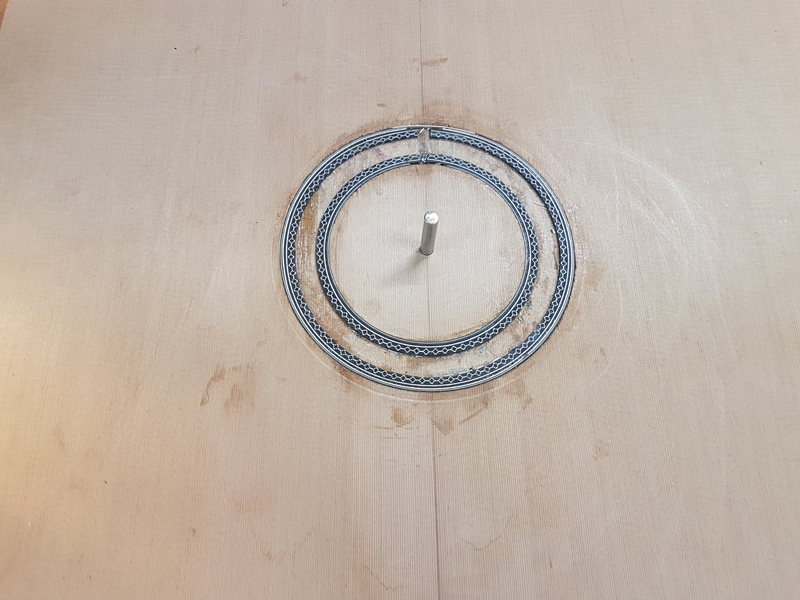 Not shown but I used a 24" fretboard radius bit to radius the fretboard and then I cut the slots. 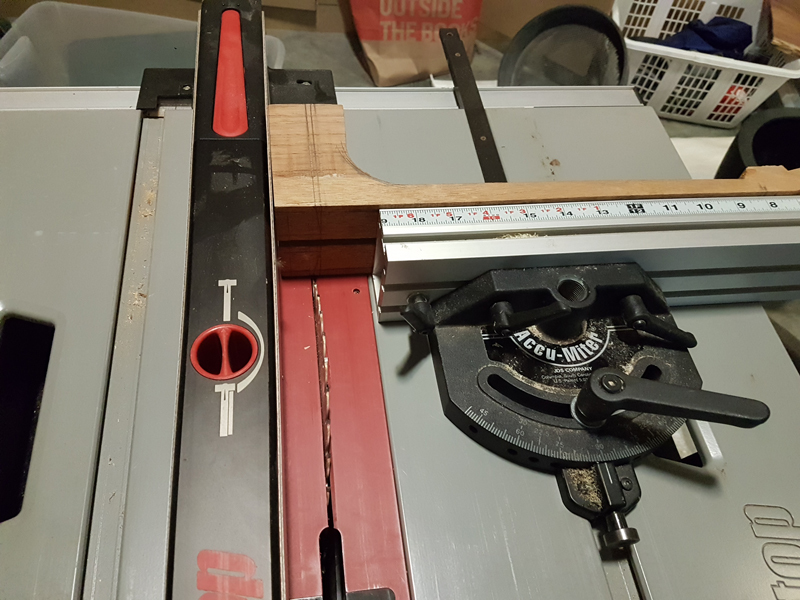 I used a plane to turn the 4 mm slice in to a wedge. 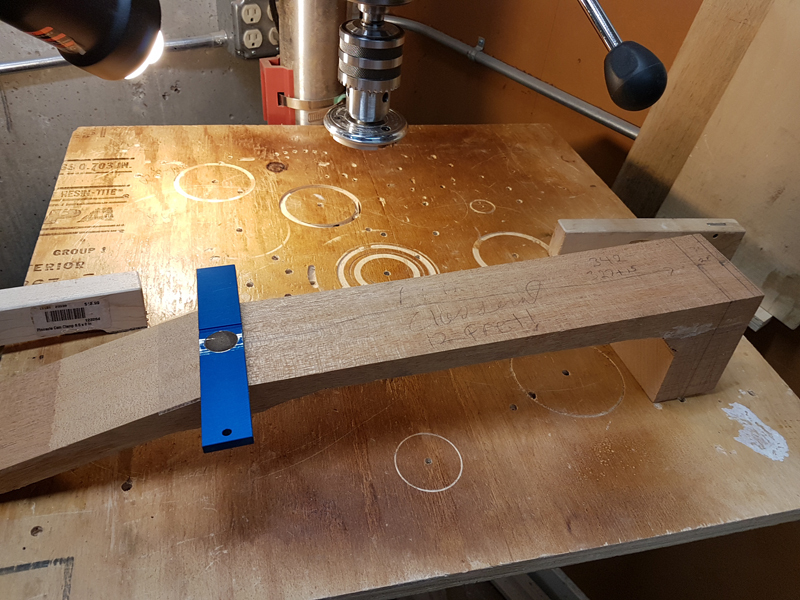 No jig or anything I make sure the plane does not start before the nut location any think I can cut with the plane with the back of the plane sitting on the 4 mm can be cut. 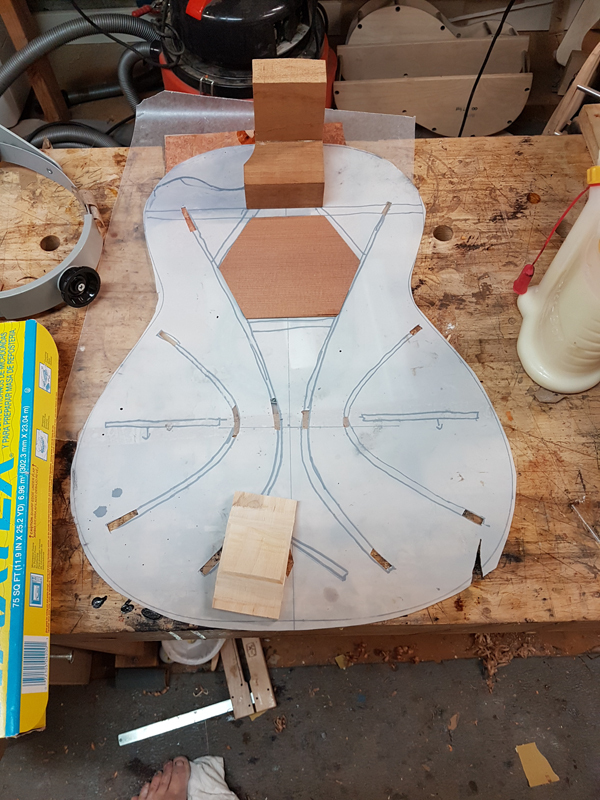 I laid out the body join and the nut location. 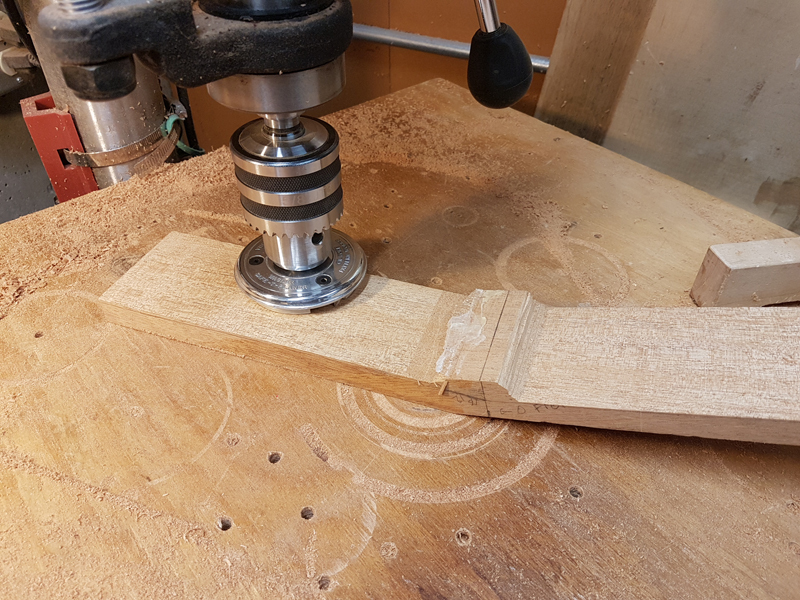 The extra bit of the wedge past the nut location will get planed back to the headstock plane. So the nut will be sitting on the wedge. Hard to explain but you will see it in a few weeks. 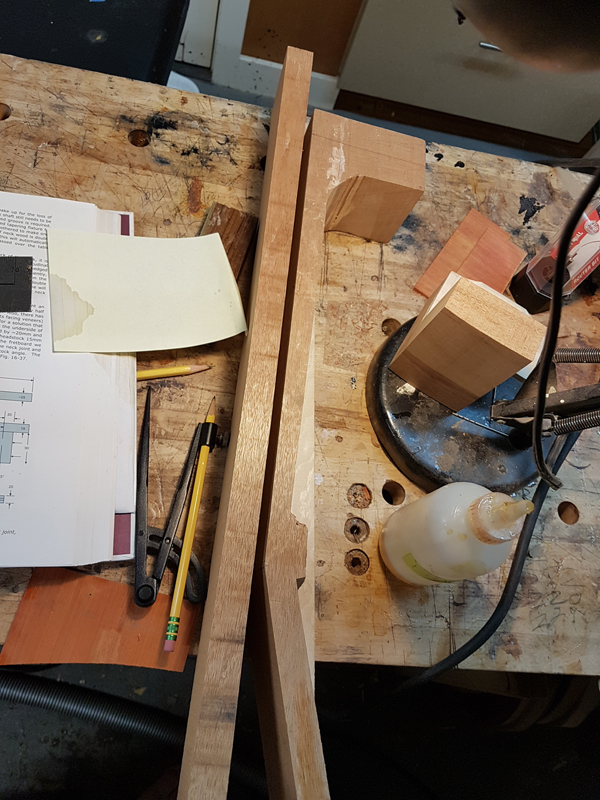 I made sure that the neck blank was square in preparation to cut the tenon. I cut the heel cheeks at 5 degrees. 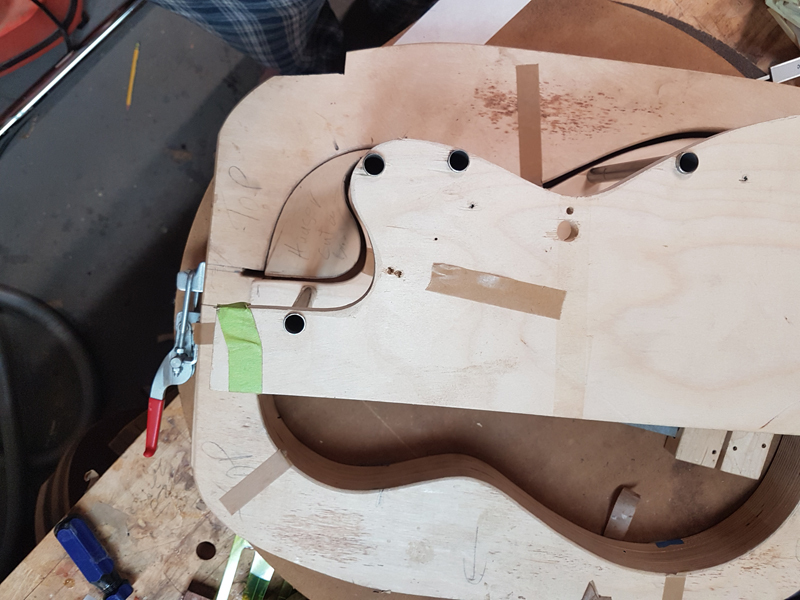 I did not put the neck angle in, I will adjust that to the body. 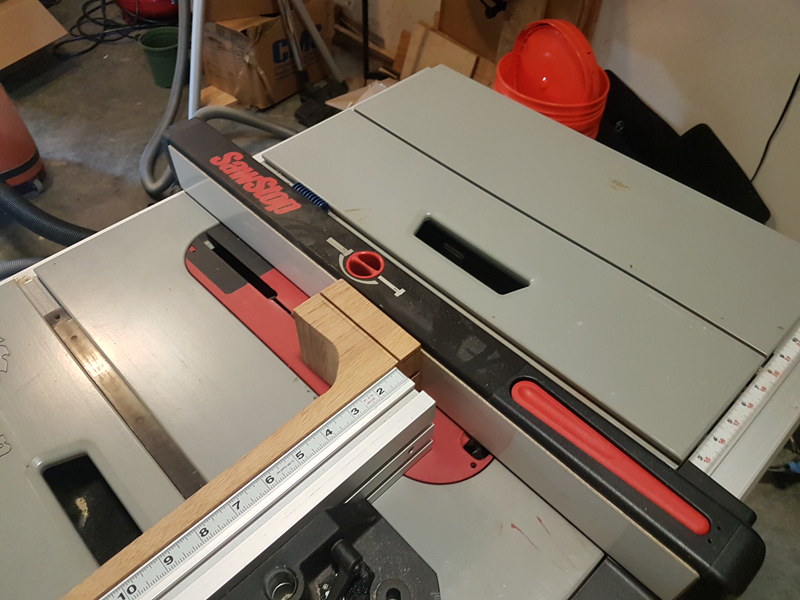 It made it easy to cut on each side. 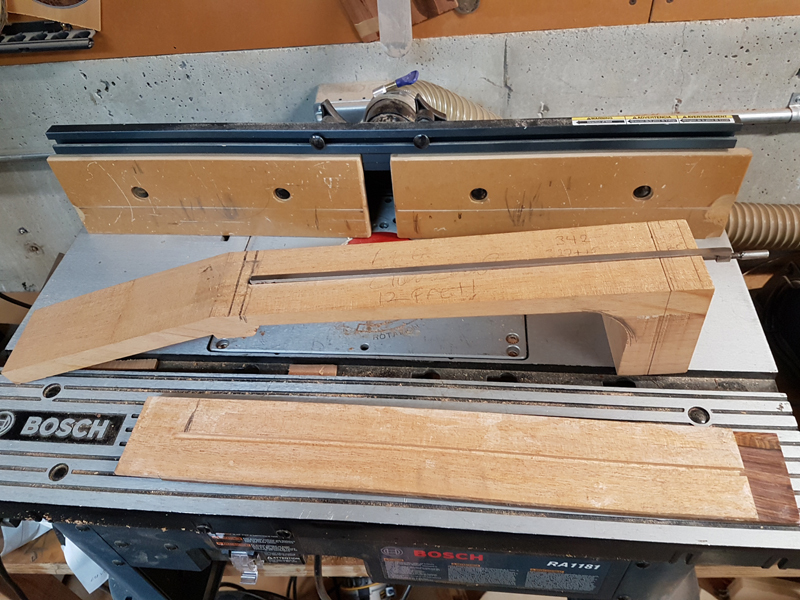 I use a tenon jig to cut out the tenon. 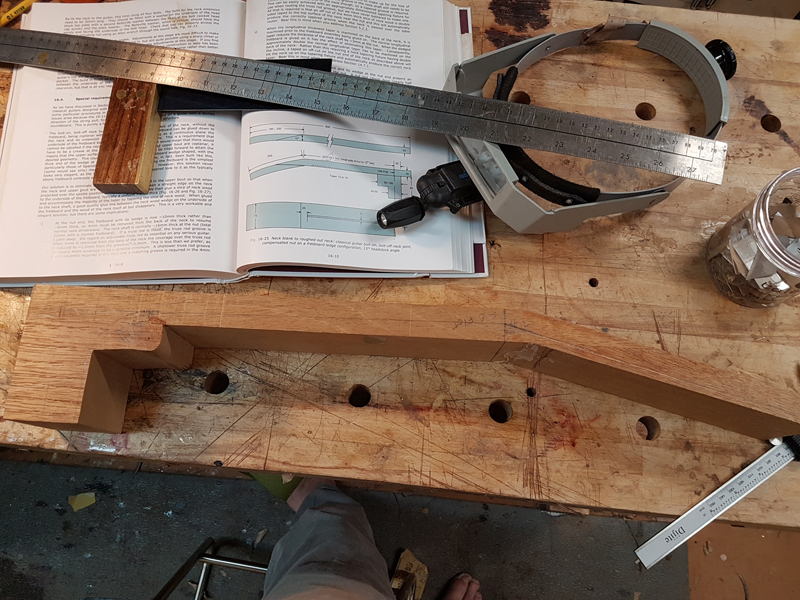 It is very safe and as I just turn the neck in the jig the tenon is always centered. 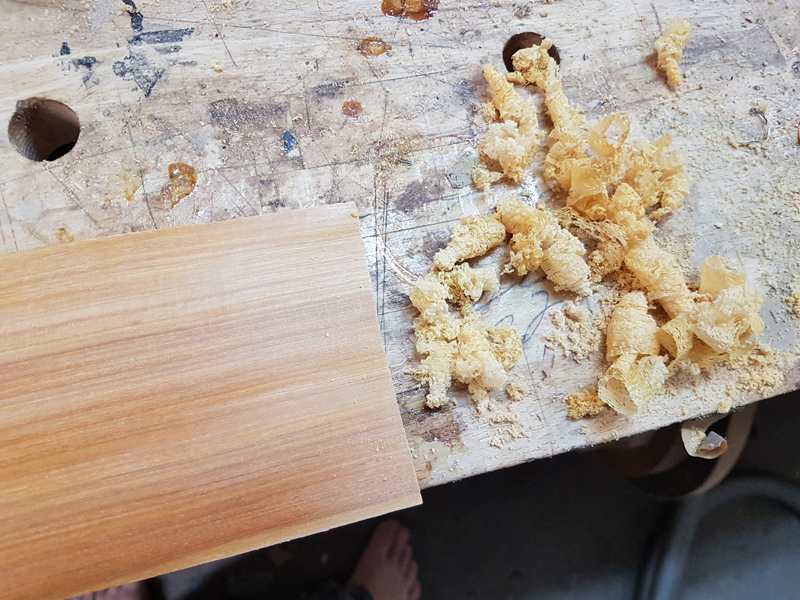 As a final step before moving on from the neck, I trimmed off the excess from the heel area. 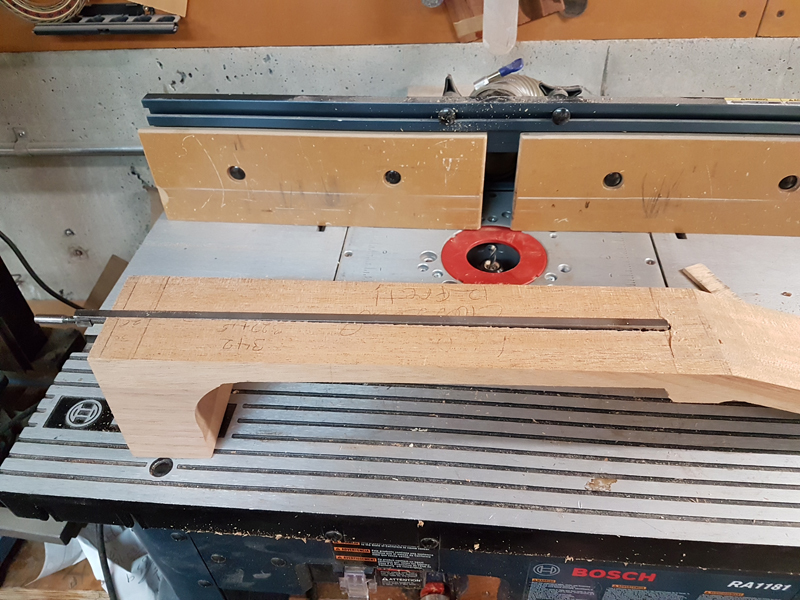 It is important to leave most of the neck square as I will need to extend the truss rod through the extension tenon once I install it later in the build. 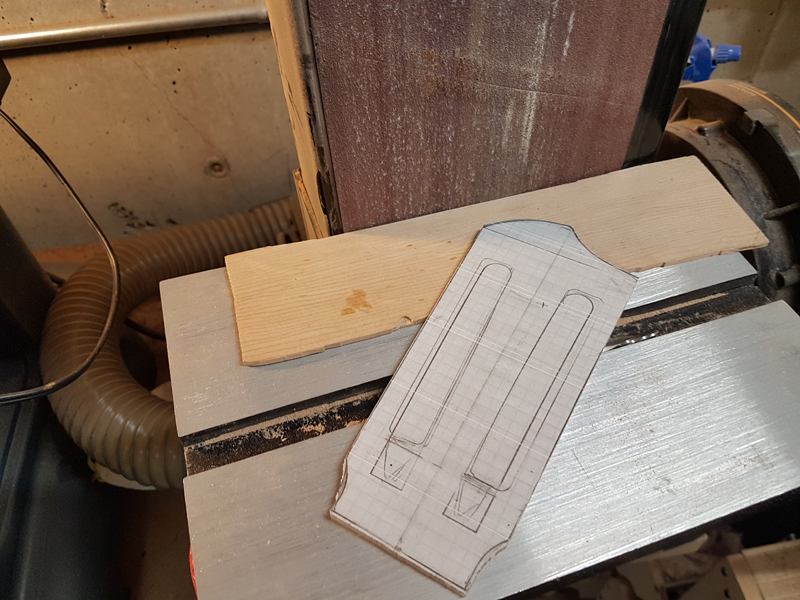 I did finish the headstock template. 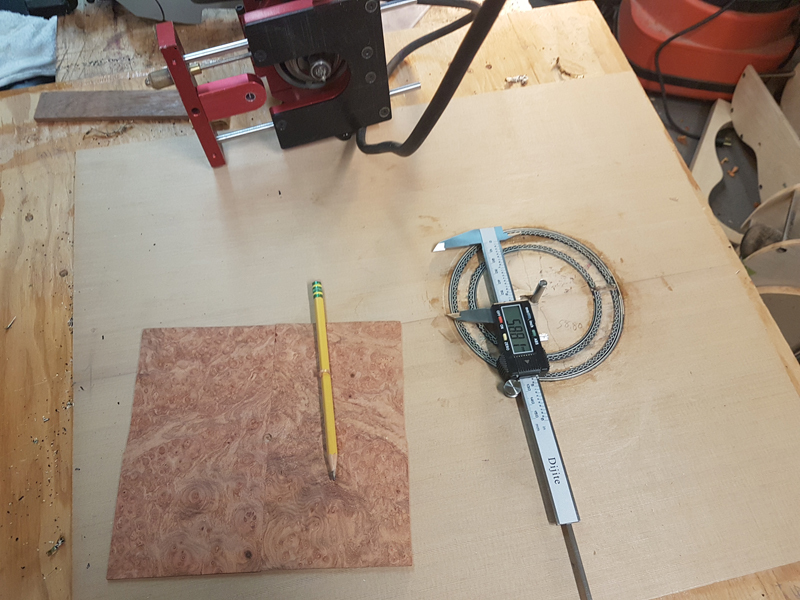 I copied and cut the template out on my band saw and cleaned it up on my belt sander and then a small drum. 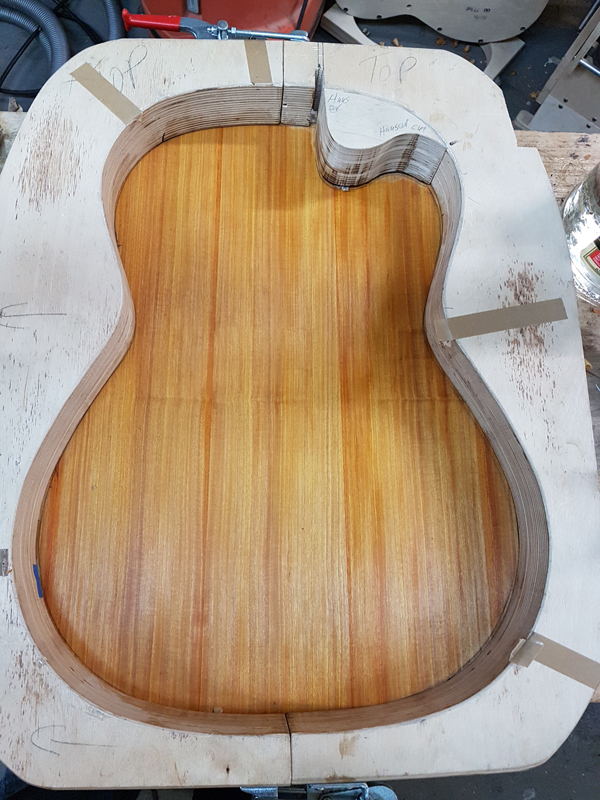 I will not profile the head until the fretboard is glued on. 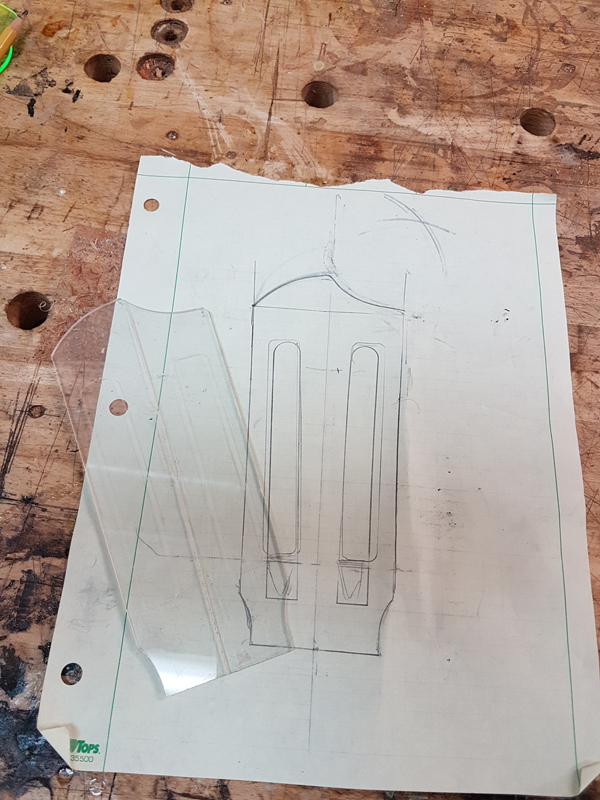 Here is the template. The last one of these guitars I made I was not happy with my back profile for the rims. No big deal as I profile them tall and sanded them back in a radius dish. 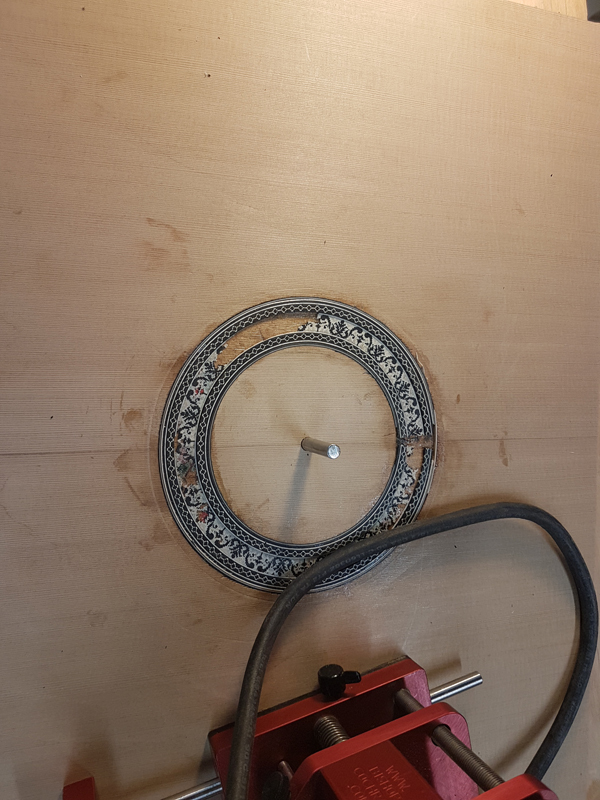 So before doing anything I checked and fixed my cardboard templates of the rims for the 10' radius that I use. 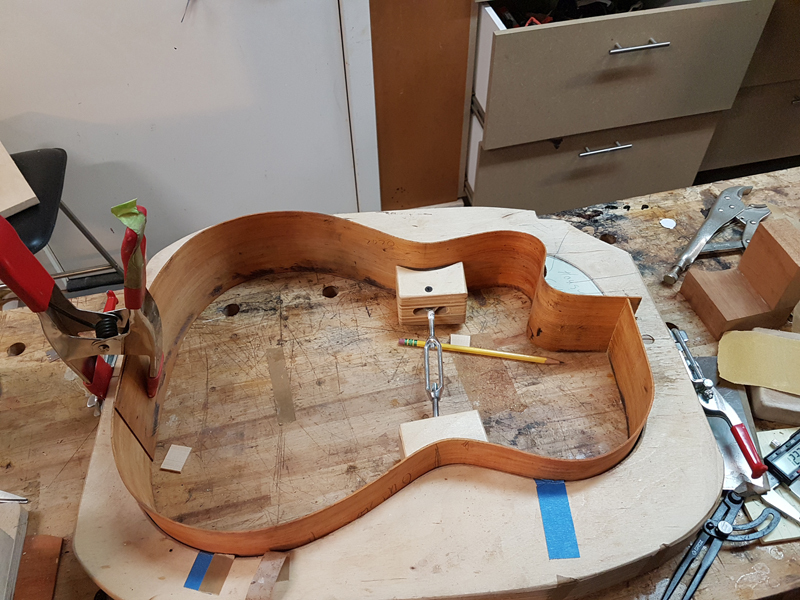 I also reworked (actually remade) My cutaway insert based on the bending form. I have never worked with Pernambuco so I had no idea how it would bend. I threw in all of the tight bending tricks I have learned on it. I profiled and carefully marked for top and outside (I have bent the profiled sides backwards in the past). 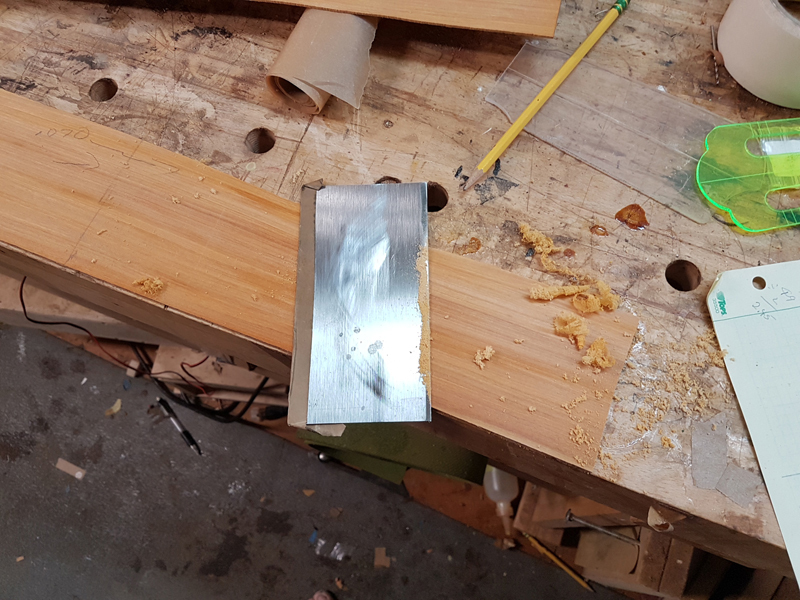 I thicknessed the sides to .080" using my drum sander. 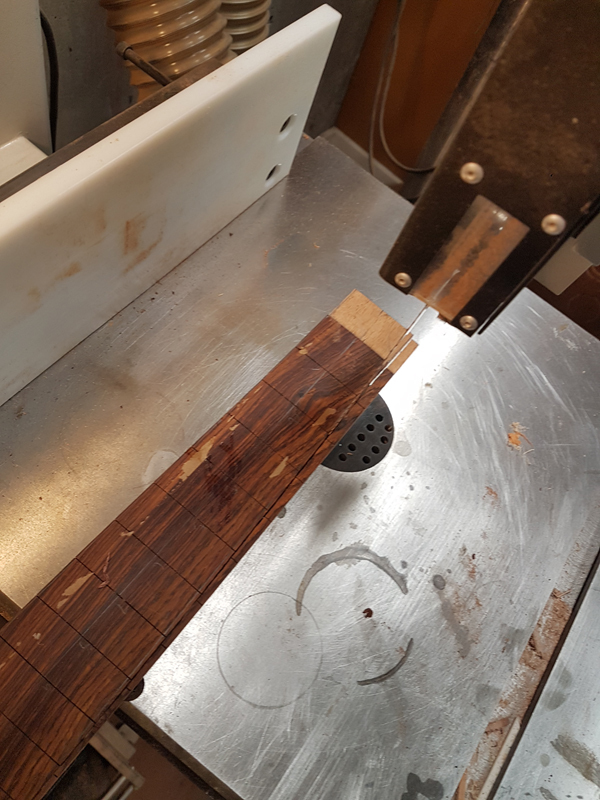 Pernambuco really clogs the paper, although unlike cocobolo I have found that I could clean the paper with a Abrasive Cleaning Stick. 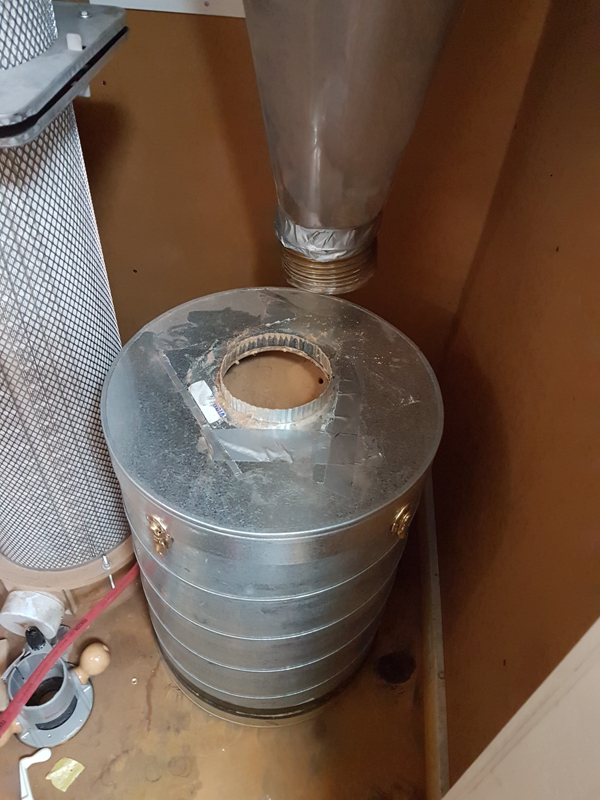 Also I found that my dust collector was nearly full but I am not sure that was the issue with this type of dust collector. 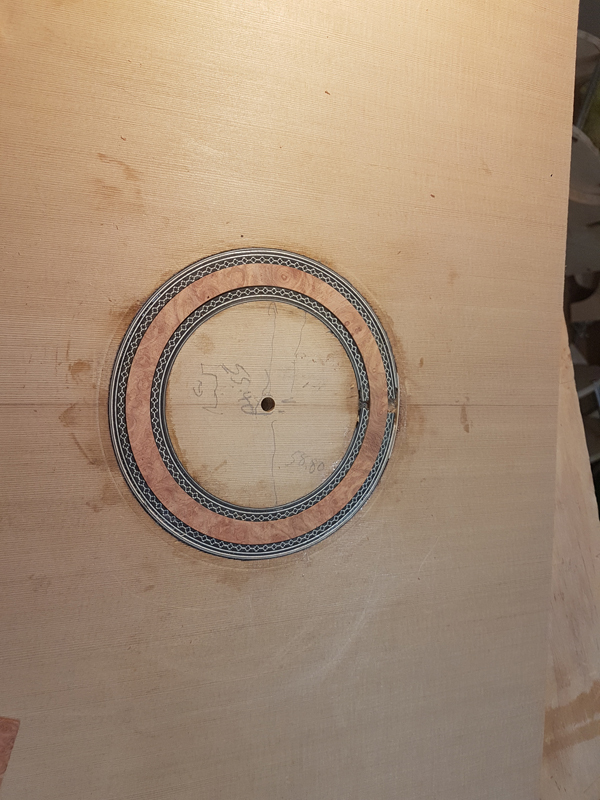 I then used a sharpened scraper on the cutaway side to take the area just past the waist to the end down to .070". 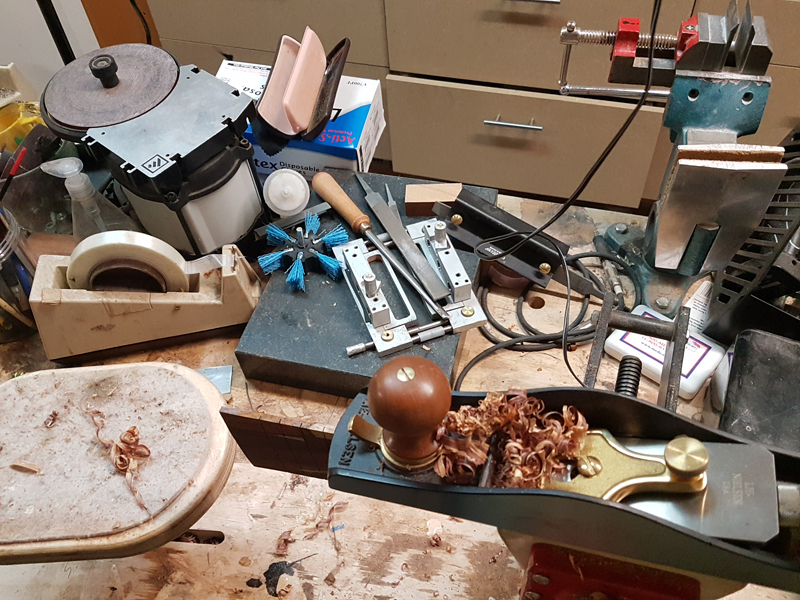 After 7 years or so I am finally getting where I can sharpen a scraper. I sprayed the sides with Supersoft II wrapped them in parchment paper and let them sit for nearly 24 hours. 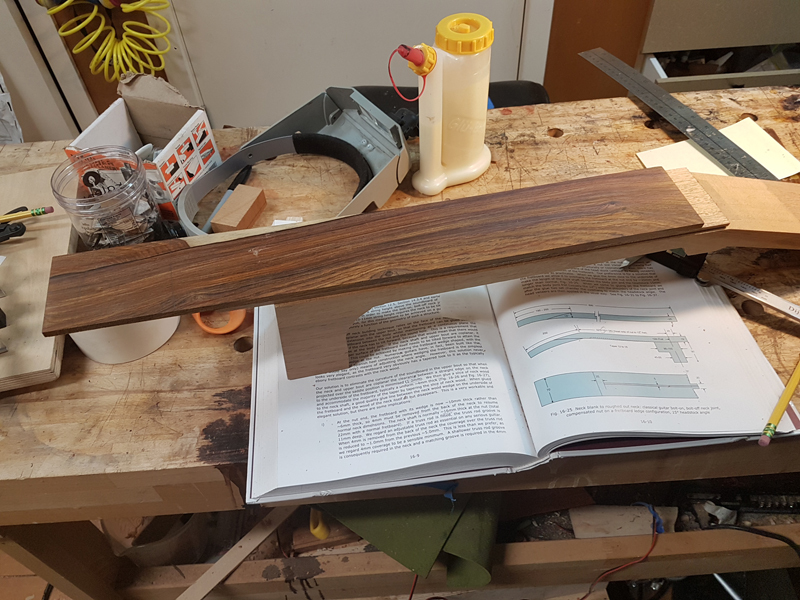 When I unwrapped the sides for bending I found there were streaks of staining looked like ebonising. I have not seen that with supersoft before. I scrapped a test area and it came right out, really only on the surface so I am not still worried about it. You can see it the pictures of the bend sides. This happened before I used heat. 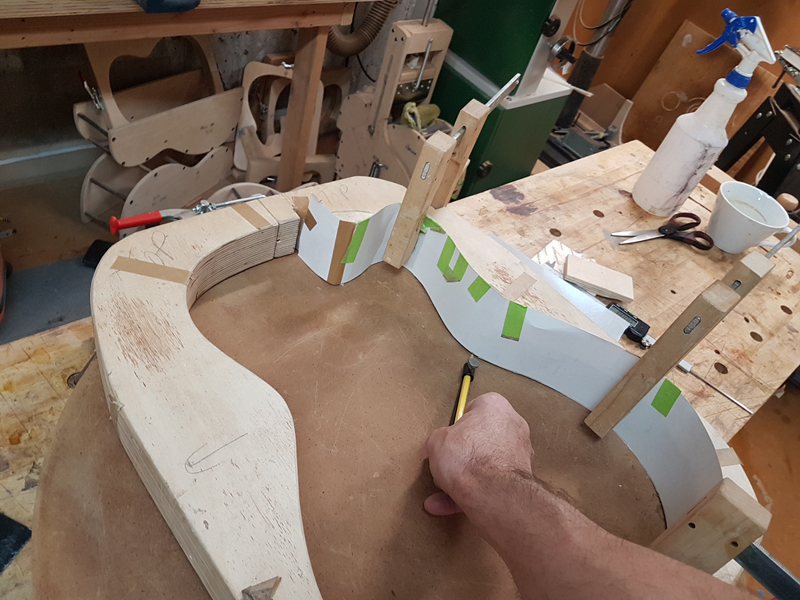 I bent the sides in a fox style side bender made by John Hall at [url=http://www.bluescreekguitars.com/shop/index.php?main_page=product_info&cPath=10_49∏ucts_id=11&zenid=3X4ZHCDI0-3Cz7L6FUEkT3]Blues Creek Guitar[/url]. 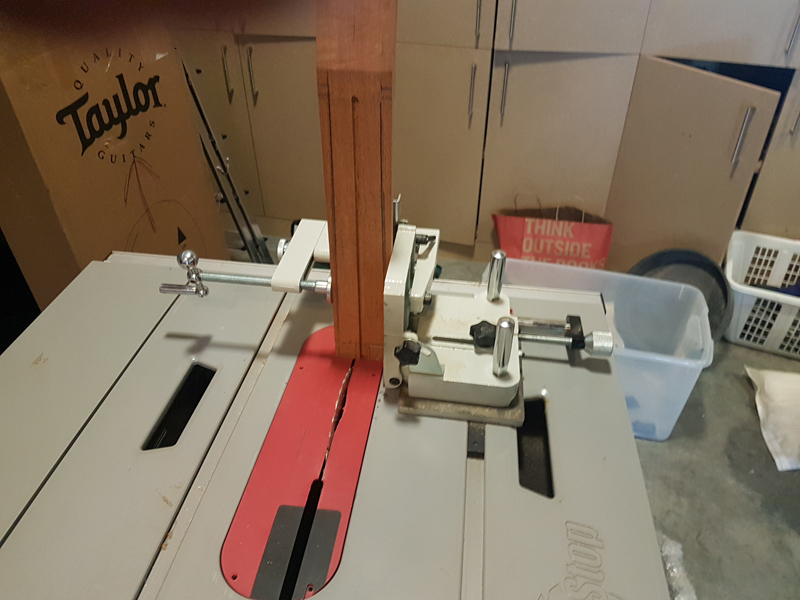 Note in the picture below, while loading the machine I clamp the very heavy side press up out of the way. 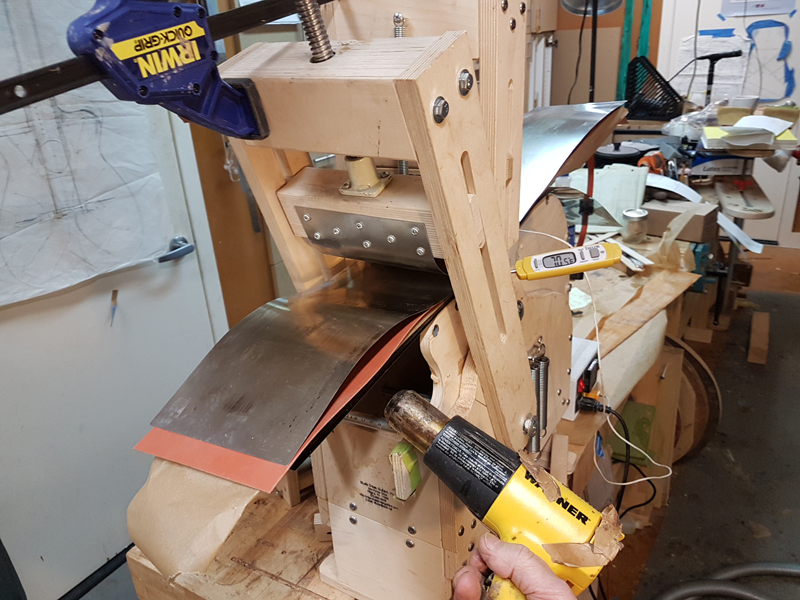 It is a real drag if the arm falls on the stiff side sticking out of the bender. That happened to a friend of mine once. Also note that while the heating blanket is warming up I am gently warming the underside of the cutaway portion of the side with a heat gun. I am on the lower setting as I do not want to scorch the wood. I am using the LMI controller with a thermocouple. I am also using a thermometer because after nearly 40 years as an electrical engineer I do not trust electronics. 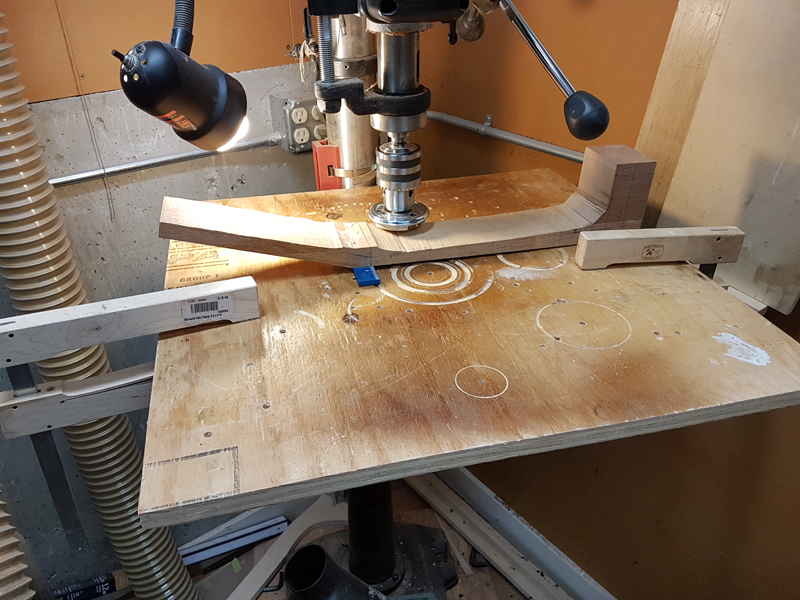 I set the controller to 300 F and when the wood starts to steam a bit, I see it at 220-240F, I start bending the waist which I bend leaving a quarter inch or so to go. I follow with the lower bout and then the cutaway or the upper bout. 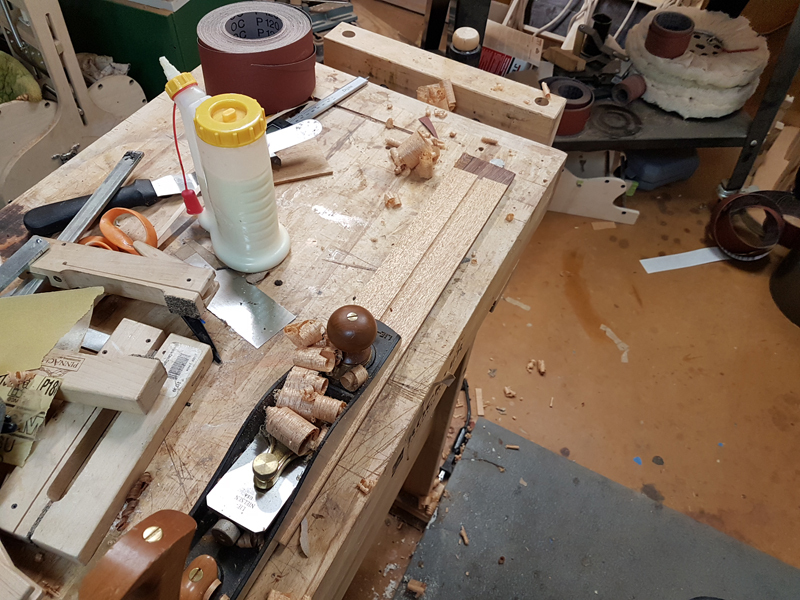 To do the cutaway area I carefully use the press to slowly make the horn bend, by moving the bress down. I take my time but also really keep moving. 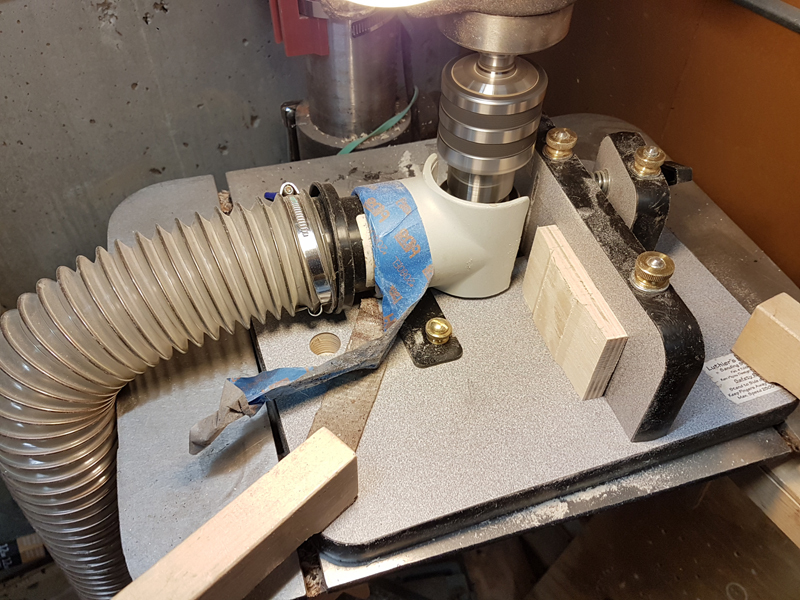 At the point where the horn is bent I start slowly tightening the press into the cutaway. When the press is seated I go back and finish the waist. Leaving the last bit of the waist to the end helps pull the bouts or the horn bend tight to the form. Amazingly the bend went well no cupping and no cracks or fibers pulling loose.